Despite the fact that white can be super hard to wear, I still love it, especially this time of year. White on white is one of my favorite combos because you can pair it with literally any color or print that you wish. For this outfit, I decided to do a mix of a few different colors. 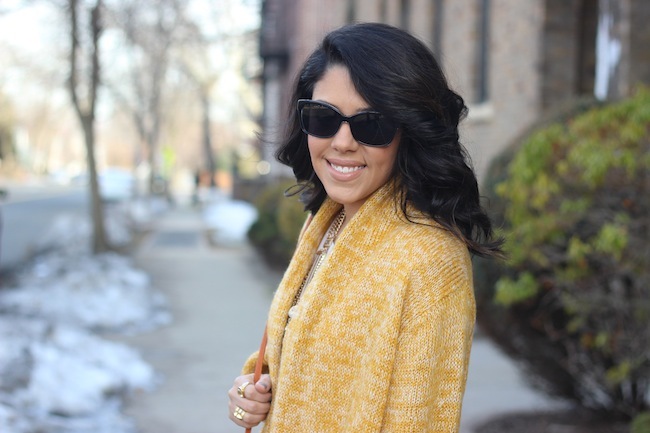 I hadn’t worn this mustard cardigan in awhile, and I really like how it pops out against the white. It’s also super cozy with an oversized fit. White and tan has also been another favorite combo of mine lately, so I decided to wear these heels. I felt like the outfit still needed something else though, so I went with this orange bag. I think it worked really well against the yellow. 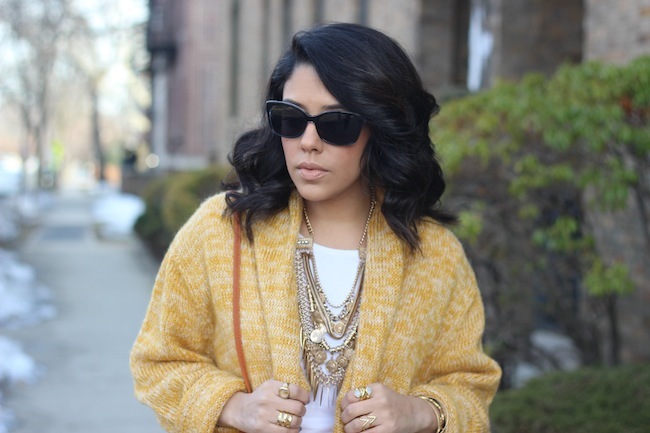 The last thing was this gold coin statement necklace, which in my opinion, is such a great finishing piece for any look. In my mind, spring has already sprung so let’s just pretend that the snow in the background is non existent. 🙂 How do you feel about wearing white? Really love this outfit! Amazing! Loving the winter white tonal look. Adding in the honeycomb yellow hue is fantastic. I like that it's more of a muted yellow as opposed to the egg yolk yellow trend of the moment. You look adorable. White can definitely be scary to wear sometimes because of stains haha, but you look so chic and stylish. I adore this combo and you did a fantastic job styling. I especially love your yellow sweater! The whole outfit looks really gorgeous, the necklace is beautiful love…, so look fabulous..
Love this look!! That necklace is everything!!! Accessories and outfit is on point! !